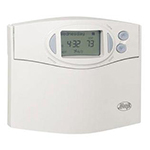 Hunter Home programmable thermostats manage the temperature in your home. The Hunter Wireless Remote Thermostat Sensor 44758 will allow you to change and monitor the temperature in your home from up to 75 feet away. 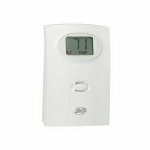 The Room Control Sensor can be made to control the thermostat based on the temperature of up to two rooms.